Planning your bathroom? Here are 7 top tips! There are 7 key areas that you must address before starting your bathroom renovation. By planning ahead, you can save yourself both time and prevent many costly mistakes that may occur in the long run. Get the location perfect – Where is your bathroom currently located? Is it in the best place for the rest of the home? If not, now may be the best time to relocate. For example, it may be beneficial to move the bathroom from downstairs to upstairs or vice versa. Remember, this is your bathroom, so design the space to fit the features you want it to have, such as a walk-in shower enclosure or whirlpool bath. Is that the best price? – If you’re working with a limited budget, you don’t have to buy all your sanitaryware from the same supplier, or with the same brand. It’s useful to stick with the colour white as this will broaden your options, and be sure to check out your local bathroom discount warehouses and online retailers. Mix and match different installations to achieve the look you’re after at the best possible cost. Check your water supply – The performance of your water system will determine the outcome of water pressure within your new bathroom installation. There is no point in upgrading your bathroom without first checking that your water system will be up to the task. If your home currently has a gravity fed system, it may be an idea to check with your plumber to see if a pressurised system can be installed, so that you’re meeting a standard demand of 3 BAR (measure of water pressure). If an upgrade isn’t an option, then look towards electrical pump installations to give you that extra boost in pressure. Turn on the lights! – Imaginative lighting can make a big difference to your finished look – Don’t just settle for a single centre mounted light bulb. Experiment with spot lights on key features, such as the bath, with dimmer controls to create a real relaxing atmosphere. Low-voltage down-lights with directional fittings can provide clean bright lighting to create a spacious feel within your bathroom. Avoid pointing lights onto mirrors, and be sure to check that all your lights meet building regulations (IPX ratings etc). Consider your heating – The ideal option for bathrooms is underfloor heating, as it’s concealed and it can make a tiled or stone floor a lot more comfortable. Alternatively, you could incorporate hot water pipes between joists which can be added to your current central heating system (you will need a mixer valve to control the extra flow). Electric UFH mats laid within the tile adhesive are also another option. Towel rails are a no brainer – easy installation with maximum benefit both practically and cosmetically. Enough ventilation? – If you don’t consider ventilation properly in the early stages of development, your newly installed bathroom will quickly become victim to mould, and unavoidable musty smells. An electric powered extractor fan mounted into a top corner is the best option, and and can be vented straight outside or up through a ceiling. Some fans can be activated by movement or humidity level, but the common method of operation is incorporating it into your light switch. 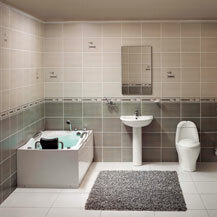 Optimise your layout – Having a shower, wash basin and WC is fine for a second bathroom or en suite, but a family bathroom needs to have a bath. Don’t try to cram too much into your new layout and try and stick to minimum practical working distances around each facility. WC’s for instance, require 45cm either side of the centre. Without spending too much cash, try using a computer program to help you decide on a layout. Google SketchUp (sketchup.google.com) is a great place to start. So what are you waiting for? Get planning!